Each of eight wineries on Steiner Road will feature two different Zinfandel selections ranging from old vines to blends to library releases that will be paired at most locations with unique small bites. Bella Grace Vineyards & Wine Cave, Charles Spinetta Winery, Deaver Vineyards, Dillian Wines, Dobra Zemlja Winery, Driven Cellars, Iron Hub Winery, and Shenandoah Vineyards. Discover the finesse, elegance and diversity of this unique terroir. 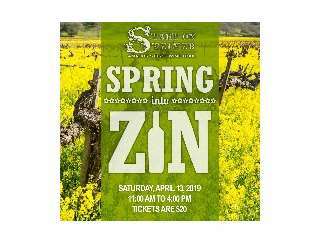 Buy tickets at startonsteiner.ticketspice.com/spring-into-zin.